Paris is often said to be the most beautiful city in the world. Full of world-famous museums, monuments, and churches, it draws over 30 million tourists a year. But Paris isn’t just for the romantics; the Ville des Lumières (City of Lights) has been developing a new, edgier side to complement her river cruises and accordion players. So, whether it’s champagne in front of the Eiffel Tower or crêpes by the Saint Martin Canal, Paris has more than enough to offer every kind of traveler. There are three main airports that serve Paris: Charles de Gaulle, Orly, and Beauvais. The first two can be reached by train, the third by bus (over an hour’s journey). As far as the Paris metro is concerned, free maps are available at ticket counters, which makes navigating your way around the underground system and bus routes easy. There is also the RATP (Parisian transport operator) app (for iPhone or Android), helpful for checking changes and times. It’s especially useful to know when the last metro leaves. If you do miss your metro, use taxi service Uber (available on the web or for iPhone or Android) or alternatively take the Velib, an almost-free bike system spanning the whole city. Use their app (available for iPhone and Android) to find where the nearest available bicycle is and where you can park it when you’re done. You’ll be spoiled for choice when it comes to choosing where to rest your head. Celebrities and the monarchy tend to stay in Paris’s “palaces“, exclusive hotels of which there are only six in the city. For the non-billionaires, there are three-to-four star hotels on almost every street. Before choosing your hotel, decide what area (“arrondissement”) you’d like to stay in. Each district has its own personality, so plan carefully. Rough Guides and Trip Advisor apps can help you choose. Another option is to stay in an apartment, either directly via the owner (through Airbnb, for example) or with an agency, of which there are many. France is synonymous with food, and her capital city is internationally famous for fine dining and la cuisine française. Paris is, unsurprisingly, home to over 70 Michelin-starred restaurants. Most have a review on the TimeOut Paris website, where you’ll also find information on eateries for smaller budgets and/or dietary requirements. Le Fooding is the guide that every Parisian checks for the best restaurants in town, but it is predominantly in French. If your français is shaky, blogs Paris By Mouth and John Talbott’s Paris are useful for up-to-date restaurant reviews and tips. For discounts and booking, The Fork often has some good deals. Street food has really taken off in the last few years with Frenchie to Go with the best sandwiches in town and food trucks such as Le Camion Qui Fume patrolling the streets. Thanks to Paris’s rich cultural diversity, there are also many good African and Asian eateries like Porokhane (Senegalese) and Higuma (Japanese). And for coffee or a glass of wine, Paris Cafés guides you to more than 110 of the city’s best cafés (iPhone only). Favorite attractions in Paris include the Eiffel Tower, Notre Dame Cathedral, the Sacré Coeur basilica, the Louvre museum, and the Arc de Triomphe among many, many more. Field Trip is a great iPhone and Android app for learning about the different landmarks in the city and navigating between them. Paris is a walkable city, and has several parks and gardens, such as the Tuileries and the Luxembourg gardens, that are perfect for an afternoon stroll. Companies such as Fat Tire Bike Tours also offer bike, segway, and walking tours around different parts of the city. Batobus boats cruise down the Seine river with a practical hop-on/hop-off ticket, including reductions for students and groups. If museums are your thing, My Museum (Apple) provides a fun and original way of discovering the Louvre. The Orsay museum and the Pompidou Center are high on the list for Paris’s best exhibitions. For avoiding the crowds, there are many smaller museums worth a visit, such as the Musée Rodin, Marmottan Monet, Carnavalet and the Nissim de Camando. 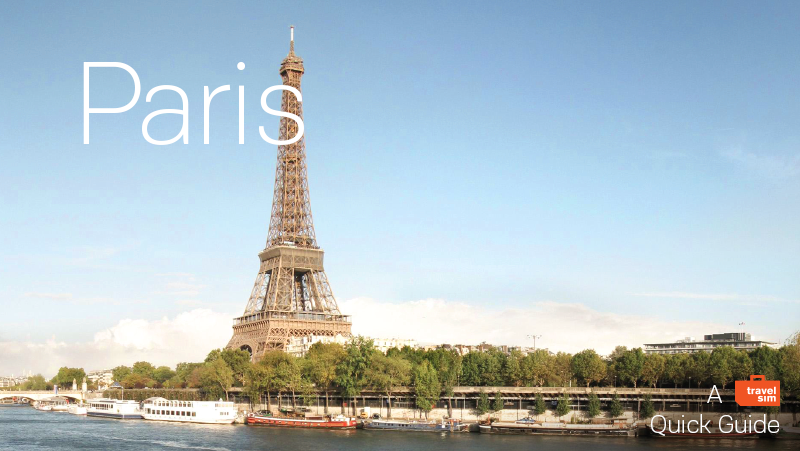 Paris Info is where English-speakers can find information on all the exhibitions in the city and its suburbs. If you prefer the unbeaten path, TimeOut will show you the underground art scene in the city, and Cinemacity has an app that lets you discover the city through the many different movies filmed here. Tight budgets need not worry, as the Talk Travel app suggests low-cost/free activities and ideas for all the family. For more apps to help you discover Paris, go to TimeOut, it’ll give you a list of great Paris-based applications in English.